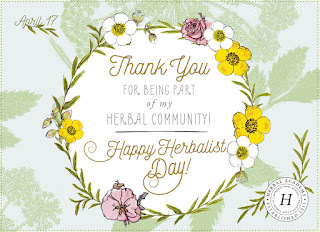 In honor of Herbalist Day, April 17th, the Herbal Academy has free downloadable Thank an Herbalist Cards for you. They are also offering a 15% discount on any of their courses through April 17th. Celebrate by downloading and sharing a card with your favorite herbalist and do take advantage of the discount and sign up for a class this spring if you are ready to expand your herbal knowledge.